Thought lost forever, tonight the world (those who didn't order the DVD from Amazon.com) gets to see the game broadcast for only the second time in history. This broadcast marks the 2nd time in only a handful of years that one of the most significant games in baseball history was unearthed from oblivion. Years ago when I started getting serious about really old classic baseball broadcast, there were only a handful of games to be known out there. 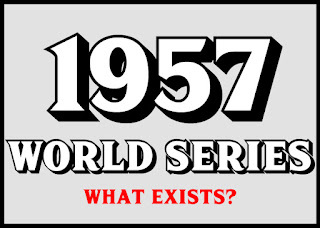 The widely circulated ones like the 1952 World Series, 1965 and 1968 World Series, as well as the 1969 Fall Classic. Most of the content was scattered over a multitude of private collector's who feared confiscation, regional sports networks/broadcast partners who feared losing their claim to copyrighted content or was hidden away in the various team/MLB vaults never to be seen by fans. With the advent of MLB Network, it seemed MLB became more focused on filling their network with content as well as doubling down on their efforts to catalog all their existing footage. Likewise, this brought more collectors out of the woodwork and made visable to non-collectors who had footage that there was someone out there looking for it. Not to continue on from this little history jaunt, this 1960 World Series game ranks up there with 1962 World Series Game 7, 1951 NL Playoff Game 3 and Aaron's 715 game as defining moments in MLB history. And tonight, for those of us not alive when Bill Mazeroski punched his HOF ticket with a 9th inning shot over the brick wall at beautiful Forbes Field, we get to experience what it must have felt like seeing it live. In this game, we get to see in live motion, not edited to only show their great feats some truely legendary figures. Maris, Mantle, Groat, The Great One, and Yogi. I only have 1 major groundrule for tonight, if you normally don't post or even if you do, make sure you use a unique username. It makes it easier to put words to one particular poster. If it is a thread of anonymous, it'll seem like all one person. If you've just been a fan in the past and never posted, jump in tonight. You might not get another chance to chat with fellow classic broadcast fans during one of the greatest events we could possibly have. Tomorrow night, I plan on live blogging the 1960 Rebroadcast. It won't be anything official in nature, more of a laid back dialogue between commenter and fans alike. Hopefully it will allow us more of a 'community' feel. It is rare that a night like tomorrow night comes along. A year ago, if you asked me to come up with a top 5 Holy Grail baseball broadcast list, this game would be on it everytime. So, let's try to make the most of it. Just drop by a little before 8 pm EST when the broadcast actually begins. At 7:30, MLB Network is airing a special on Bing Crosby and the discovery of this print. So, I'll put up a post tomorrow afternoon and drop by during the broadcast and give a running commentary of what you think of the broadcast. Let's have some fun with it. Discoveries like this will become fewer and further between from here on out. In the immortal words of the late Jack Buck: We'll See You Tomorrow Night!